Liz Dickinson is a busy woman. The former Oracle, AT&T and IBM employee founded Mio in 1999, and built from scratch a company that brought the first strapless heart rate monitor watch to market; a company which now has partnerships with the likes of Adidas and TomTom. And I'm running late for our meeting at The Wearable Tech Show in London. The good news is that so is Liz; she's one place behind me in the queue for show passes. "Did you see the Apple event last night?" she asks me after we'd realised whom one another was. "How disappointing it was," she remarks. It's not the last time Apple would come in for criticism during our time together. Liz is passionate about heart rate monitoring. After the birth of her third child in 1999, she decided that she needed to optimise her spare time so that any periods spent exercising were as effective as possible. She knew this meant detailed bpm-based training but wasn't prepared to wear a chest strap everytime she went for a run. "I thought it ludicrous that you had to wear a chest strap," she tells us. "Astounding." "Your heart rate is the best indicator of your fitness level; resting heart rate is a great predictor of how fit you are and, in fact, the best indicator of how fit you are is how fast your heart rate recovers in one minute," she explains enthusiastically. But she says there wasn't a feasible consumer facing product on the market at the time. She decided to take matters into her own hands, and on to her own wrist, using her tech industry contacts to create a prototype that QVC eventually showed interest in. The shopping network ended up being Mio's first supplier. The first Mio product required a user to touch their fingers onto the sensors to get a reading but Liz knew that a band that offered continuous heart rate monitoring was what was needed. This was in 2001, over a decade before the likes of Fitbit and Microsoft came to market with their continuous heart rate tracking wearables. "We designed it from day one to meet the needs of the performance athlete," the Mio CEO tells us. "We took three years to perfect the switch from ECG to continuous." And it's this dedication and heritage that Dickinson claims puts Mio streets ahead of its new rivals. "Fitbit took a huge risk by introducing heart rate monitoring that they felt was 'good enough' for their consumers," Dickinson explains. "But, by adding heart rate monitoring, they crossed over a line. By putting something in that wasn't accurate they've really alienated a large group of their consumers." Dickinson is, of course, referring to Fitbit's new PurePulse technology, as found in its Charge HR and Surge devices. "I know it's not accurate," she states, confidently. "Why it's not accurate is because they've addressed the problem like everybody else in the past has tried to do it with a very singular view of what the issues are. "They did their best but it's a very complicated problem. Photoresistor technology has existed for decades and it's not an accident that there has never been an accurate heart rate monitor in the market that works at high performance speeds. "We've tested it. Our consumers have tested it and even Fitbit admits it. They go right out and say 'it's accurate enough for us'. But doesn't the lifestyle consumer deserve accurate heart rate monitoring?" Dickinson states Fitbit customers are so unimpressed by the new wearables that they are directly contacting her while seeking heart rate monitor device alternatives. "I don't really have to get the message out because it's getting out for us," she tells us. "So I don't have to do anything because [Fitbit customers] are emailing me, they're writing on forums and they're writing reviews. Word of mouth in today's world is the number one factor." Dickinson isn't concerned about the threat of the Apple Watch either. While she admits that the Cupertino company's forthcoming wearable will raise the profile of heart rate monitoring for mainstream consumers, she dismisses the Apple Watch as a serious sports device. "Apple gave up on continuous heart rate because they would have had to make too many compromises with the design and material selection to be put accurate heart rate monitoring in," she claims. "I think it's going to create awareness, people are going to start to ask the question, 'why do I need to know about my heart rate and what does it tell me?'" she continued. 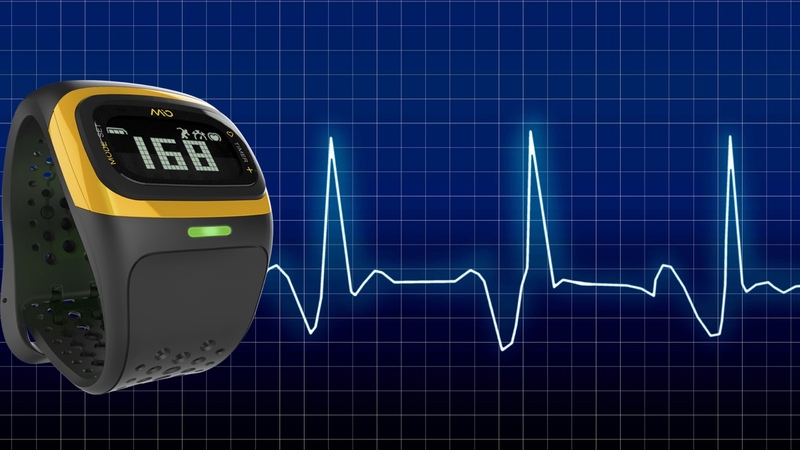 "The conversation with the everyday consumer about heart rate is now a big deal. It took 20 years at least before people started to understand step technology; a metric related to something as basic as taking steps. "How long is it going to take to get people to understand metrics related to heart rate, which is nowhere near as easy to grasp and certainly not easy to count?" Mio currently has four products on the market – the Fuse, the Alpha 2, the Velo and the Link – but there's plenty more in the pipeline. Dickinson told us that a next-gen sensor is in the works and we can expect to see some "beautiful products" arriving later in the year. With the likes of Samsung, Motorola and Huawei all slapping heart rate sensors into their Android Wear devices – all of which are inaccurate according to the Mio boss – we couldn't resist asking if yet more Mio partnerships could be in the works. "I wouldn't be opposed to it but so far no-one's really asked us," Dickinson admitted. Our advice to those traditional tech powerhouses? Give Liz a call. If our Android Wear reviews have shown anything, it's that they could do with all the help they can when it comes to heart rate monitoring.